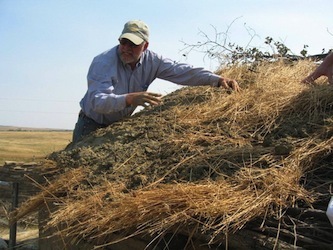 Last fall I reported on the most unlikely architectural feature that I have ever attempted to restore: a pitched earthen roof in the northern Great Plains. I explained how I had borrowed a technology from a flat earthen roof in the Hopi village of Oraibi and attempted to apply it in a spectacularly unforgiving climate. To recapitulate, the Hutmacher Farm near Killdeer, North Dakota, was established in 1928 by Ukrainian/German immigrants. The assemblage of buildings is constructed of local ledge-stone laid up in mud mortar, and the roofs utilized several varieties of wooden logs as ridge beams, rafters and a brush mat. Above that was a straw thatch capped with a massive layer of pulverulent clay. The challenge has been to reduce the maintenance cycle on the clay layer that was prone to prompt removal by wind, rain, hail -- you name it. Hutmacher family lore, as told firsthand by the children who still live nearby, holds that there were certain "issues" with the roof. They remember their father, Frank, in true granger fashion walking livestock around in a large earthen basin to mix the clay and water. The kids would then toss wads of it onto the roof where it would be raked neatly into place. One of the daughters recalls a neighbor coming by during the process and hollering up to Frank, "Hey, what are you doing?" Frank paused in his labors to consider whether the question was friendly, ironic or just plain stupid, and replied, "What does it look like? I'm shingling," and went back to work. The "issue" was that the place had to be shingled every year. Early last spring, I got a call from Preservation North Dakota asking when I could come assess the results. I asked for a few photos to get a sense of how the roof had fared, but the director played it very cagey. No photos -- he wanted me to see first-hand and cruelly would not divulge whether the news was good or bad. I was annoyed, and a bit puzzled by his inadequation, but decided to play whatever game he had in mind. There were various delays, but I finally got up there two weeks ago, in the middle of July. Being fearful of the worst, my actions perhaps even having led to the complete collapse of the entire homestead, I could not resist going out early on the morning we were to meet so that if a quick escape were called for, I would be prepared. I arrived just after dawn and was amazed at what I saw. The layered plan, derived from the Hopi roof, had held up astonishingly well. We had only had time last fall to do all three coats on a very small section of the roof, and our third coat had failed. But the two beneath it had withstood the inordinate onslaught of weather, particularly the incessant, driving spring rains, almost unscathed. So I considered it safe to stay. 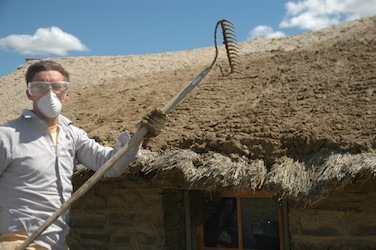 We spent two days re-designing and applying the upper coat of the earthen roofing system in a manner that I am now confident will be successful. In a nutshell, I sought out and found an angular aggregate in a wide range of sizes that will replace the rounded river rock we used on the final coat last year. The Hutmacher Farm got shingled again, this time for a much longer duration.